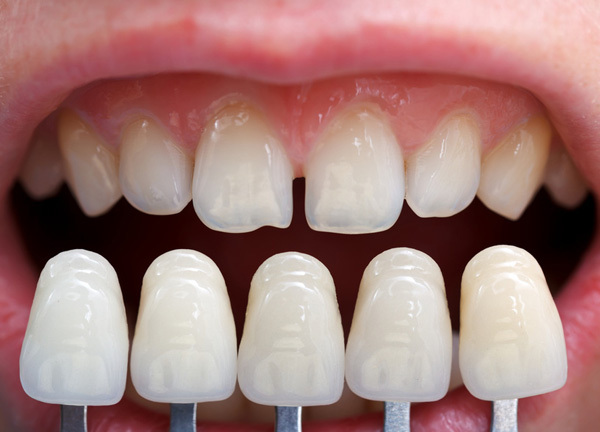 Dental veneers are becoming an increasingly popular treatment for patients who want a whiter, healthier-looking smile. These thin porcelain shells can be used to enhance the appearance of your teeth or conceal such flaws as chips, cracks, worn enamel, discoloration, misshapen teeth or misalignments. If you have gum disease or tooth decay, these conditions will need to be treated for the best results and the healthiest smile. Because your teeth must be filed down before the veneers can be placed, the procedure is not considered reversible. Those who suffer from bruxism, or teeth grinding, may need to talk to our specialist for porcelain veneers in Los Angeles about treatment options or night guards, which can be worn during sleep to protect both your veneers and your teeth. Porcelain veneers can be used on their own or as one of several procedures to improve and enhance your whole smile. Our specialist for dental veneers in Los Angeles will begin by performing a comprehensive dental exam to determine the best treatment options for your smile. A smile analysis can help us better understand your goals and identify your personal preferences as we work with you to design your new smile. Computer imaging may be able to offer a preview of your new smile and give you an opportunity to adjust it as desired. A dental laboratory will craft your porcelain veneers, and you will return to our office to have them permanently bonded to your teeth. Your new porcelain veneers will be strong, durable and stain-resistant, but maintaining them can help extend their lifespan. Brush twice daily, floss daily and visit our dentist every six months for a cleaning and dental exam. Avoid biting hard objects, such as your fingernails or pencils, or using your teeth as tools. If you drink alcohol, you may need to limit your intake since large amounts of alcohol can deteriorate the bonding cement. When properly maintained, they can last 20 years or more. Contact our dental office today to learn more or to schedule your initial consultation with our Los Angeles porcelain veneers dentist.